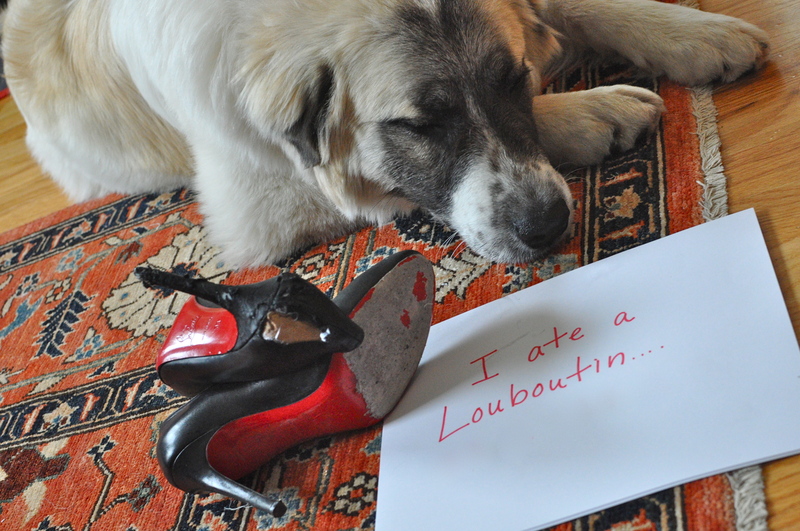 I ate a Louboutin: first I went for the running shoes. Once I devoured those, I went for the brand new replacement pair. When those proved a bore, I thought, “what the hell” and went for the holy grail. Posted July 8th, 2013 .
oh your mommy must loooooove you!!! Oh I just would cry…. Ah! a dog with expensive taste! Fortunately, one of my dogs has never chewed shoes and the other only chews up cheap flip flops. I’m lucky… but I have had to buy several pairs of flip flops. Great Taste!! And yes, what a GREAT reason to buy more!! Yes, I can rely to that, me 2 dogs ate 3 pairs before I learned the lesson. I literally gasped in horror! Me Too. It was physically painful when I first looked at the photo. Me three. Wanted to cry. I’m so glad mine don’t eat shoes anymore. Not that I have a pair of Louboutins. Yet. But that dog is a cutie! Actually he looks like he is ready for a nap. Do the louboutin’s have tryptophane like a turkey???? Anatolian Shepherd by any chance? Great dogs. Shoes can always be replaced. I just threw up. I feel sick for the owner!!! This is why mine are stored high up! O. M. G. I would die. Just omg. They are NOT ‘just shoes’ they are Louboutins. Oh man you must looooooooooooove that puppy. This makes me very grateful that the only shoes my dog has ever eaten were some $3 foam flip flops. Perhaps you would like a play date with the “I Ate A Jimmy Choo” who lives in my house? Maybe close the closet door? UGH I feel your pain! My foster did the EXACT same thing! 2 pairs of running shoes and then louboutins!! I sent her to the neighbors for 2 hours, couldn’t even look at her without crying.